October is Dyslexia Awareness Month and on 15 October 2015 I was contacted through twitter by a group that brings awareness to Dyslexia in children. 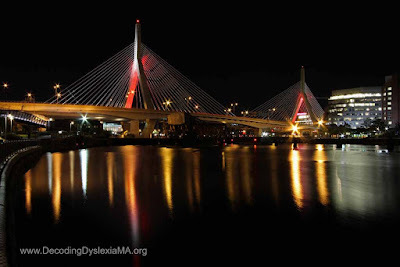 That night the Zakim Bridge was supposed to light up red in support of the cause and Decoding Dyslexia MA asked if I could take some pictures of the Bunker Hill Bridge in Charlestown, MA. I was planning of photographing in the area and of course said immediately yes. Traffic as usually was horrendous in Boston and when I finally arrived on location I only found the bridge lit up blue - how disappointing. I decided to take some long exposure photography images and while waiting I tweeted the group asking them to contact Mass Transportation authorities and ask them to turn on the red. They did and sure enough 20 minutes later the lights on this Boston landmark finally turned the right color. Twilight at this point has already passed and I only got a bunch of photographs with a pitch black sky. Nonetheless it was a great experience and the group brought Dyslexia back on my radar - good job everybody!